AT&T has authorized stores in its Northern California region to begin taking iPhone pre-sale orders with a promise of 72hr availability, according to the manager of one of the region’s busiest stores. In an email sent to store managers this morning, the wireless carrier said stores could promise customers they would have a phone in 3 days if they sign up for new service or upgrade their eligible hardware in-store and pass the requisite credit checks to establish a new two year service contract. Customers get a call from the store in three days when their phone arrives and are required to return to the store to complete service activation and pick up the handset. Long lines are still present at the few Apple Stores in the country with inventory today, as iPhone buyers remain wiling to stand in line for two to three hours to make purchases directly from Apple. Earlier today AT&T said iPhone 3G sales during the first twelve days were nearly double that of last year, despite shortages that have seen backorders up to three weeks at some of its retail stores nationwide. A company spokesman confirmed the official policy indicating a 13 to 14 day wait on direct-ship orders this afternoon, but indicated some regions could have greater availability than others. Does this mean that the iPhone order I placed here in NYC a week ago will be shipping soon? I like how I’m probably going to have to wait the full 21 days, while someone can walk in today and pick up an iPhone by Saturday. Thanks AT&T! You’re really making me feel good for switching back to you! Oh well, no hard feelings towards my North Cali brothers. Go now before you’re stuck waiting too! I had the same problem as Mike above, where adding an iPhone to a family plan at the Apple store was impossible. I then went to the nearest AT&T store, and put in my reservation thinking that it would take the entire 7 days they said at the store to arrive. It got there within three days, and the overall experience was much more satisfying than driving store to store and wasting time and gas. When my iPhone arrived the AT&T store rep called and let me know it was there, and within 25 minutes I was up and running. I would highly recommend this option. I called my local San Francisco AT&T store upon hearing this and they knew nothing about it. (I think SF counts as “Northern California”.) The agent on the phone quoted me 20 days to a month for pre-orders to be delivered. 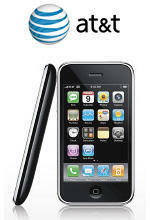 Because of my existing AT&T plan, the iPhone MUST be activated by an AT&T store. All SF AT&T stores have been sold out since the morning of July 11, and APlle won’t give them any more, and Apple won’t sell me one from their store to be activated by AT&T later, so I have to wait for one to appear at an AT&T Store. I pre-ordered/direct-ship ordered an iPhone 3G from this store last weekend. She checked the status for me: pending. Which the service agent “thinks” it means is that it hasn’t shipped yet.